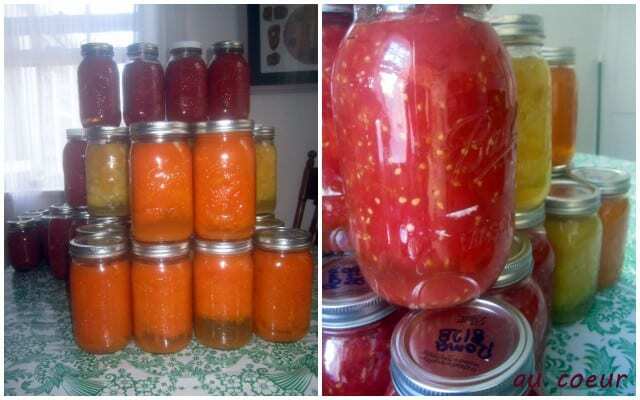 Make sure you read the post on canning basics first! This isn’t so much of a recipe as it is a safe and easy first canning project. After a few years of making and canning tomato sauce, I’ve learned that it’s not worth all the extra time and effort. As I mentioned in the intro to canning post, maintaining an acidic pH is key to hot water bath preserving. As such, not a lot of extras (like other veggies) can be added to the sauce; and since I almost always want chunky tomato sauce fortified with onions, peppers, rustically cut garlic, eggplant, and/or squash, I was having to spend time adding those things to my jarred sauce. I found that it was easier to preserve crushed tomatoes than to spend time making sauce which I was only going to doctor up later anyway. It also saves time, because sauce has to boil down and thicken for an hour or two, which matter’s a lot when I’m canning large amounts. This, then, is a how-to on crushed tomatoes. If you’re looking for a sauce recipe, I’ve had good results with Barbara Kingsolver’s. Add water to canner or pot and begin to heat, covered. Prepare jars and lids, washing in hot soapy water. Set the two other pots on stove; fill one with water for blanching and heat to just under a boil. Prepare tomatoes(see notes): Working in batches of four to six tomatoes (depending upon the size of your blanching pot), cut an x in the bottom of the tomatoes and drop into the simmering water. Blanch for 30 seconds or until the skin is just starting to split. Remove tomatoes from water with a slotted spoon and dunk in a cold water bath to cool. When cooled enough to handle, peel tomatoes, core and skin. Crush tomatoes into second large pot. Once enough tomatoes cover the bottom of the pot, heat to boiling, stirring occasionally as you repeat process with additional tomatoes. You can see from my pictures that this is a pretty messy stage. I usually put a towel on the floor to catch inevitable drips of tomato juice. When my cutting board starts to get too wet, I pour the juice into the pot with the crushed tomatoes. Once tomatoes have simmered for at least 5 minutes, begin to fill jars. Add bottled lemon juice (1 tablespoon per pint or 2 tablespoons per quart), and leave 1/2 inch headspace. Put lids and metal rings on jars. Process pints for 35 minutes and quarts for 45 minutes. Don’t forget that the water has to stay at a rolling boil this entire time. Remove jars from water and set on a towel on the kitchen table. Allow jars to cool 12-24 hours before testing seal on lid. You should hear “pings” shortly after the jars are removed from the water, and cooled, sealed lids will not move when pressed in the center. Label with date and food, remove metal ring, and store in a cool dry place. Enjoy within one year. This is the first year I’ve done it the “right” way. If you have less time or aren’t up for peeling tomatoes, you can core them and run them through the food processor before canning instead (they still have to simmer 5 minutes). The skin is definitely noticeable, but doesn’t ruin the final product. You don’t have to prepare all of your tomatoes before you start processing jars. I make just enough to fill the jars for my first batch, then prepare more once they’re in the water. I try to time everything so there’s as little dead time as possible.